RESTAURANT QUALITY CRISPY CRUST: high heat capacity pizza cooking stones with 0.5 inch thickness + heat core makes it easier to achieve crispy crust. Perfect for pizzas, artisan bread, focaccia, biscuits, cookies and baking other crispy, flavored rich pastries. This stone allows you to try out your favorite recipes from cookbooks/blogs which you have come across on google. EASE of LIFTING: 0.4 inch feet elevation design allows ease of lifting by slipping your fingers right under. Versatile tool for a home cook meal during cold winter nights with your families and love ones or outdoor BBQ parties with your friends on your charcoal or gas grill. Expand your menu to include everyone's favorite crispy crust pizza. 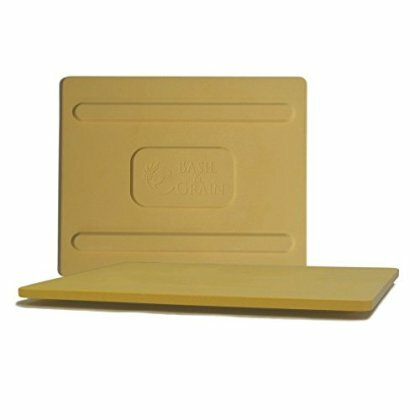 DOES NOT BREAK EASILY: Top quality foam prevent hidden cracks or fractures due to delivery. Special formulated cordierite material allows this stone to withstand heat up to 1000 °F. Why purchase a stone that will crack after a few uses due to poor packaging when you can have one that will last. FOOD CONTACT SAFETY REGULATED: Our stones are subjected to rigorous routine test in the U.S. by SGS North America Inc. for compliance with FDA, RoHS, EC, LFGB standards. It is essential for kitchen wares to be regulated for safety if it comes in contact with food.